When I was still pregnant with Cecilia, I was doing all sorts of research on things that wouldn't affect her for some time, because I was (still am) completely immersed in all things baby. Amongst those topics I did my homework on was first foods. 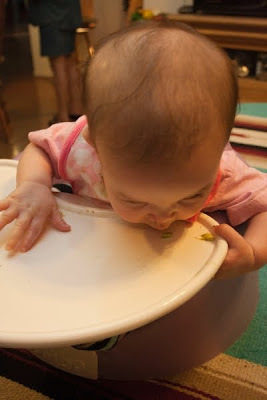 Traditionally, you're told to start feeding your baby rice cereal somewhere between 4 and 6 months of age. 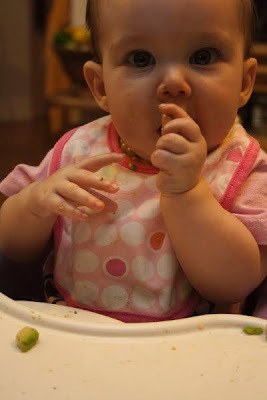 But as I did my reading, I came across something called "baby led weaning (BLW)." 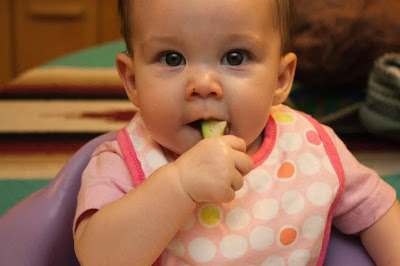 The name is somewhat misleading, as "weaning" implies stopping breastfeeding. In reality, BLW is about starting solids by skipping purees (either homemade or jarred food) altogether and going straight to finger foods. 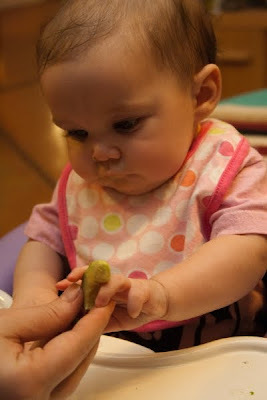 BLW allows babies to explore taste, texture, color and smell; encourages independence and confidence; helps to develop babies' hand-eye coordination and chewing skills; and makes picky eating and mealtime battles less likely. Before starting solids, it's best for babies to have hit certain milestones. 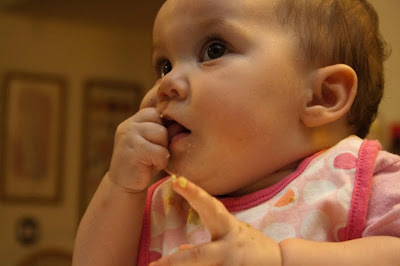 The biggest ones are sitting independently, loss of the infant tongue thrust, the ability to pick up smallish objects and bring them to the mouth and an interest in eating. Most babies get to this point between 6-8 months of age-- not the 4-6 months traditionally recommended. Waiting until the baby has accomplished the above milestones helps ensure that she's really ready for solids. Her digestive tract is more mature and there is less chance that she'll have gut issues from starting food. There are other benefits to delaying solids. The most interesting that has recently come to light is that delaying solids might actually lessen the chance of obesity. Quite interesting! Anyway, avocado is considered one of the best first baby foods, because it's high in healthy fats that baby needs, they're high in vitamins and minerals, they're easy to digest, and the mild flavor is pretty palatable for most babies. So, we waited until Cecilia was over 6 months old, sitting independently, not infant tongue-thrusting, and able to pick up things easily. 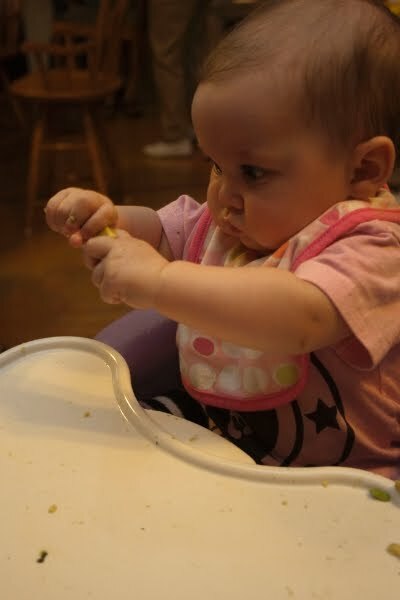 Some photos of the results-- she didn't eat a ton, but she definitely enjoyed what she did eat! Six months ago, you came into my life after 38 weeks of waiting and 31 years of yearning. 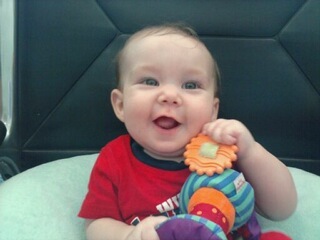 Six months ago, my life changed so dramatically, and it will never be the same again. Six months ago, a piece of my heart settled in place where it belonged, as a part of me. Six months ago, I discovered what "unconditional love" really meant. Six months ago, you showed me that I could feel feelings that I never knew were possible. I love you with every breath of my being. I will always be there for you, and I will never stop loving you unconditionally. You are my dream come true, my sweet little Cecilia.